In Barcelona during MWC, HTC unveiled its take on virtual reality, that being the HTC (Re) Vive. According to HTC, they have one of the most immersive headsets to be available by the end of this year, made in partnership with Valve games. Starting in Spring of 2015, HTC will ship out developer edition units to start building up its available content, but at this point, there is no word on pricing. As partnerships go, Valve will handle the VR tracking and input side of the headset, while HTC will be in charge of design and engineering. “Vive combines Valve’s Steam VR tracking and input technologies with HTC’s world-renowned design and engineering talent, setting a new gold standard for an industry that has, until now, struggled to move beyond concept stage,” HTC stated in a press release. With Vive, HTC intros a Full Room Scale 360 Degree Solution, which allows a user to completely immerse themselves in a virtual environment. With this, not only can you sit down and enjoy virtual reality, but you can get up and walk around, exploring your VR space. While that could be a tad dangerous, we will see how HTC plans to implement such a feature. 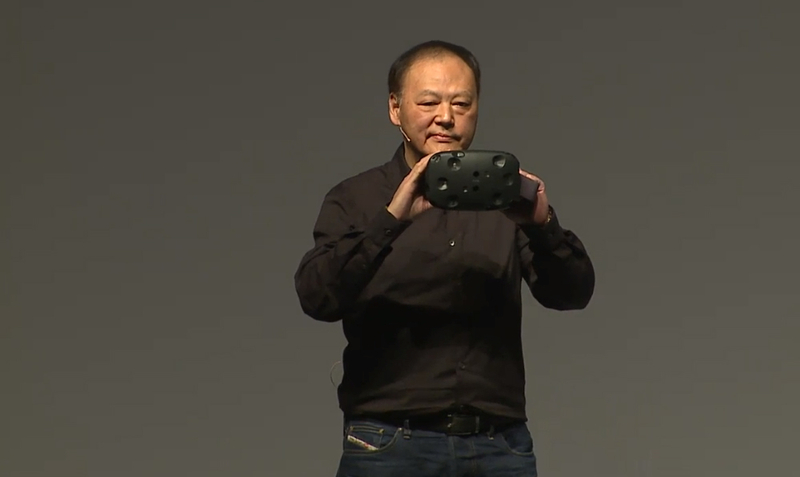 Again, Vive is scheduled for consumer launch at the end of 2015. Until then, share your thoughts below. But if you ask us, Peter Chou’s facial expression in the header image above speaks for us. Barcelona, Spain, March 1, 2015 – HTC, a pioneer in innovative, smart technologies, today announced plans to bring mass-market virtual reality (VR) one step closer. Through a strategic partnership with Valve, HTC promises to transform the way in which consumers interact with technology and the world around them with the debut of HTC Vive. HTC Vive Developer Edition will be launched this Spring, with the consumer edition available by the end of 2015.